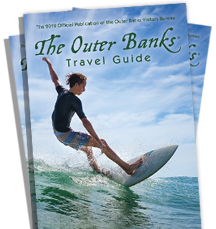 Do a little searching about the OBX, and you will quickly pick up on its reputation of having been the first place in history where one thing or another happened. Be it the first flight in Kitty Hawk, the first Union victory of the Civil War, the first all African-American US Lifesaving Service or perhaps, legendary claims of piracy and heroism passed down through local families. Set aside some time to explore the roots of the OBX, and find your place in an evolving American Story.